HomeHeadphone ComparisonsAudio Technica ATH M50 vs. Grado SR80i headphones | DIFFERENCES! Before we get into the Audio Technica ATH M50 vs. Grado SR80i headphones, grab a snack, sit back and relax because.. Both of these models sound wise are exceptional, although the M50 edges out Grado in every other category. Reviewers have marveled at the clarity and the sound-stage that the the SR80i’s provide, although most people became very underwhelmed in other aspects of the phone, namely comfort and durability. Channel separation of the 80i’s is great however, with each instrument being clear and not drowned out by another. Keep in mind the SR 80i’s are a bit of an older model, and are now discontinued by the manufacturer. A great set of cans sound wise, people raved about the little details that you can hear with these on. In listening to an acoustic guitar, you will hear the buzz of the strings, the sliding of the fingers, and the actual contact between the pick and the string. Subtle things that you would have never heard with a cheap $20 set. Fold flat for easy transport. Powered easily by an iPod (no amp needed). Great for rock and metal. Good for low level listening. Build quality is suspect (very consistent throughout reviews). Quite a bit of sound bleed/leakage. They feel a bit flimsy. The sound quality is amazing, the build quality isn’t so great, and they are not that comfortable. They also lack a bass presence that the M50’s provide in spades. Other than that they are exactly the same, and one of the best pairs of headphones for their price. 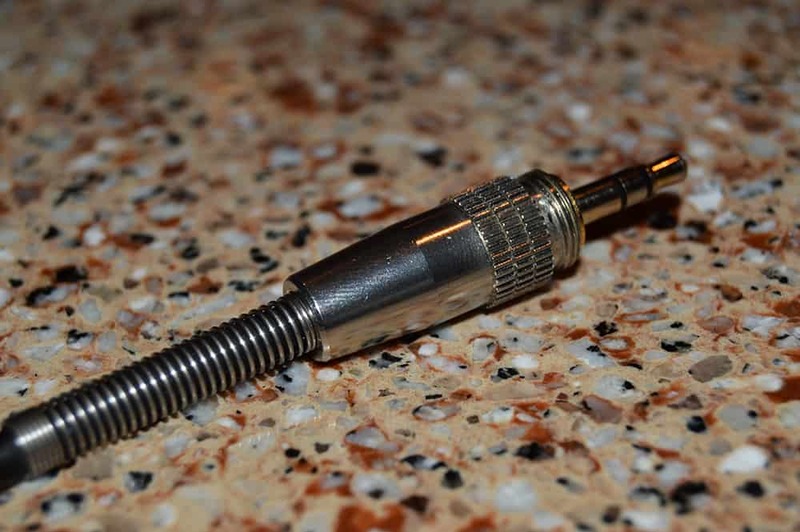 If you are new to the world of audiophiles, these will make you look at music in an entirely different way. That’s not to say that they are better than everything else out there. But as an entry level set, they will change your entire perspective on how music should sound. Unlike the 80i’s, the M50’s excel in nearly every category, and just may be the most common upper entry level headphone reviewed, talked about, and purchased. Vivid clarity between each instrument. Ear pads cracking ever so slightly (after 2 years). No effect on sound. A great set of mixing headphones that also work extremely well for casual listening. The bass is tight and punchy, and for the most part controlled. The ear-pads are prone to cracking after a couple of years, and they can get a bit fatiguing after really long listening sessions. Both have really great clarity and crispness to them. Both give an accurate reproduction of sound. The Grado SR80i’s are now discontinued by the manufacturer. The M50’s are great for hip-hop/rap, and have a deep bass response. The Grado’s are more suited for rock, metal, classical and jazz. They are lacking in the bass frequency department. The build quality of the Grado’s is poor by almost all accounts. They M50’s are as sturdy as it gets. Mine have been through a lot of abuse and come out strong man status every time. The SR80i’s have a really great sound, but aren’t that comfortable, and the build quality is suspect. The M50’s by contrast have the total package. Sound, comfort, longevity, and affordability. If you are more into rock, classical, and jazz, where a strong bass emphasis is not at the forefront, you may want to look into the SR80’s. Go with the e version though! CLICK HERE TO READ THE REVIEWS ON AMAZON! CLICK HERE TO LEARN MORE IN MY OFFICIAL GRADO LABS SR80e REVIEW!! If you value a deep and tight bass response, and listen to more hip-hop, EDM and the like, then the 50’s are where it’s at. Go with the 50x’s though! SEE THEM ON AMAZON FOR YOURSELF!! Well that’s about it for today my friend! 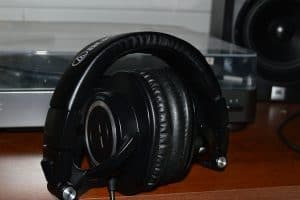 Hope you enjoyed my Audio Technica ATH M50 vs. Grado SR80i headphones review, and came away with a better idea of each of these headphones strengths and weaknesses. Which model tickles your fancy more?? I would love to hear from you. Until next time.. This is a great comparison of two great model headphones. You obviously really know your sound equipment and how they should preform. I like that the m50x are more durable because I tend to be rough on them. But I’m not crazy about deep bass, are these adjustable in range at all? Thanks again for your recommendation and helpful info. Yes, these are fully adjustable, and in fact the adjustment part is made of stainless steel which gives them a nice look. The Headband itself has not cracked at all in 2 1/2 years for me!! A very nice set indeed.. I am all about great headphones and willing to spend the money on great ones, but I do not like the look of headphones that fully cover your ears. I recently took a plane trip with some other friends and had some cheapy head phones. Despite the face that my volume was all the way up, it was still hard to hear the movie we rented. Now my freind sitting next to me brought his own, which he spent about $150 as well, but these did not cover the ears, yet when you put them on you couldn’t hear any background noise, like the airplane itself. Do you have anyrecommendation for earphones like that? Also, were they noise cancelling do you know? What a great website and informative posts! I can tell you know a whole lot about sound equipment! I am not really into all that but I was looking for a great pair of headphones because I love my music but my headphones aren’t of the great quality. I have tried some expensive headphones before and they made a huge difference for sure! Those are more on the expensive side but they must worth every penny. 1) A great entry level set for you would probably be the Sennheiser HD 202’s.. (around $23) These are purely for enjoyment, and sound great! They are super durable and the minimalist construction will have you being as reckless as you want with ’em. They simply don’t break! I have them and use them a lot for those late night netflix sessions, or gaming.. Kind of an all purpose set.. They have a long wire which is great for lounging in bed in front of the TV. 2) The Sennheiser HD 280’s are an all around great set, a bit neutral meaning they don’t accentuate any particular frequency (bass, treble, etc.) They are an honest reproduction of the sound you hear. They also boast really good clarity and crispness.. Be advised they are kind of a reference can, but to you they will sound amazing.. About $99. Think of the M50’s as these, but on steroids. Thanks for this. I was checking out a dj controller for a while and I’m actually thinking of Djing on my down time just for fun. I won’t be djing at clubs or anything as of yet. Would you recommend the M50X to a bedroom DJ type of person? You can’t go wrong with these, and yeah I would totally recommend them to anyone in any situation. Think of them as sort of an all purpose set. They do well in virtually any environment.. Mixing/reference, easy listening, DJing, watching movies, etc.. They are closed back which is ideal for you, as you want to be able to focus on your mix without outside distractions. I mix with them a lot in my studio! (in addition to using my monitors). They are really comfortable and extremely durable as well and I’ve never had to take them off due to discomfort..had ’em for 2 1/2 years! I can’t speak enough about ’em. Back when i got my 50’s.. they only came in black.. The 50x’s now come in like 4 different colors. Lol. with a detachable cable. Thanks for providing an in-depth analysis on two great headphones. 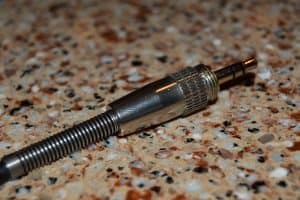 I am looking to get a new pair of headphones because my old ones have been through a lot of abuse and now there is a short in the wire. The M50x seems to be a higher quality and more durable set of headphones. You did mention that the ear pads might crack around the two year mark. How prevalent is that problem? And do you know if the M50x’s come with any kind of warranty. Once again, thanks for a great review. The cracking is very minor, and is actually my fault! I have worn them quite a bit out of the shower, and I’m sure this contributed greatly to the wear. A very minor nit pick and doesn’t affect my comfort level at all. I can only speak to my own experience on it. But just for you I scoured the amazon reviews and only saw one person say his were cracked. It was at the top of the headband and they were white. I highly recommend these!! The warranty is 2 years..
Any other quesitons let me know!! I’ll be honest I would’nt touch the Grado’s with a barge pole if the Audio Technica ATH M50 were laid out in front of me. I haven’t tried out the updated versions but the M50’s rocked studio and live settings. I was recently forced to go through a live set with a set of 4 seinheiser cans ( spelled it wrong! ) and I was really surprised at their quality for the price. What are your views on them? Hey Chris! I own the Sennheiser HD 280’s, and I must say I was underwhelmed when I first put them on. Only after some hours of burn in was I able to appreciate their truly flat frequency response. They are a GREAT set of budget cans for mixing, and do not hype any of the frequency’s. The bass now sounds tight and controlled, but never in your face. By contrast, the M50’s bass is super punchy, while still remaining tight with no distortion. I think part of the reason I wasn’t feeling the 280’s at first was because I had grown so accustomed (and spoiled!) by the M50’s for over 2 years! Undoubtedly, a beginning audio enthusiast would probably be blown away by the sound of the Senn’s. I usually fall asleep with them on. They are my bed time cans because they sound so pleasant. I also own the HD 201’s and 202’s, both great sets of entry level headphones that won’t break the bank. Admittedly, I will never go back to budget cans such as these because I’ve already heard better. They will make a believer out of you if you’ve never heard anything better than factory ear-buds, or cheap CVS phones. My next purchase is going to probably be a set of Sennheiser HD 600’s, Beyerdynamic DT 880’s, or AKG K701 (or 702). These 3 models represent the logical next step from what I have currently. Great review of the two products! I love your enthusiasm for what you are doing. It shows through in your writing and lets the reader know that you are serious about your music. Because of your enthusiasm, and your great personal style of writing, I was drawn in to your article and thoroughly enjoyed your information. I wish you all the best in your endeavors. Thanks for stopping by and recognizing the passion I have for this stuff. Please come back anytime! Do you have experience wearing these headphones for longer periods of time? I have found that with certain pairs I’ve owned that I get headaches after an extended time period of having them on. Are you planning on doing a review on the SR80e in the future against M50x? Also, how do these headphones stack up against bose and beats over ear headphones? 1) I have experience with the M50’s for long periods of time, upwards of 6-8 hours with really long sessions. I’ve had the M50’s for 2 1/2 years now, and can vouche for their comfort. Sometimes you will forget you’re wearing them! 2) As for the Grado’s, I’ve done quite a bit of research, and the consensus is that they aren’t that comfortable over a long period. Being over ear headphones, you may have to adjust them quite a bit. I could definitely do a comparison of the SR80e if you want! 3) Personally, I don’t know much about Bose other than a lot of their models are noise cancelling. The M50’s aren’t that, but they do come very close in terms of isolating sound. You will not be able to hear much outside noise.. So they do a fine job of that. 4) I prefer over ear headphones, and the consensus on Beats by Dre (i’m assuming that’s what you meant) is that they are very bass heavy, and give an unrealistic reproduction of the low end. It’s very “hyped” if you will. Plus they are a bit too expensive and are a bit of a rip-off. It’s mostly all marketing and less about the quality of the product. A great pair of headphones makes all the difference when making music while out and about. Recently I bought myself some similar headphones, a slightly different model to these. I sometimes sit in my car on a viewpoint, with my laptop and my new headphones plugged. It’s a great way to listen back to some music that I’m working on, without having to be stuck indoors. The only problem was, after about 30 or 40 minutes this old guy pulled up with his music blaring really loudly, so I had too leave at that point. Thanks much for sharing! What kind of headphones did you buy? Thank you for this information, it was very useful. It looks like really good bargain. You made my search easier because I didn’t have to look for the cons regarding this model. It is Ironic how I found this page because my boyfriend is looking to build his own studio in his home I will tell him about it! 🙂 Thank you. Thanks for stopping by! I really do hope you mention my website to your boyfriend. That would be awesome! Hope to hear from you again soon..
first off those look beautiful! Even the casing looks nice. Would you recommend these for like studio work or just listening to music? I’m mostly into hip op anyway so it might not be the one for me, but I’m going to share this my dad and see if he likes it! Thanks! BTW, I’m thinking about some Beats by Dre in the future, what do you think of those? Hey Matt! Hope you’ve been well and are pumping out those tracks! Anywho, which cans are you referring to? The M50’s are great for both studio work AND easy listening! That’s what makes them really versatile. It’s really a best of both worlds scenario. Perfect for hip-hop. The bass is super tight and hits hard, but still remains clean and not overpowered. I’ve had mine for 2 1/2 years and couldn’t be happier! Just get ’em. As far as the Grados, never had them but did a lot of research and can’t recommend them. Beats by Dre? Stay away. Over-hyped bass and over priced. Hope that narrows it down for you! 😉 I would much appreciate it if you passed this along to your dad as well.. Thank you! How do these match up to beats by dre? I own a pair of beats and I have to say they are the best headphones I have ever had. While these seem like great headphones, would you say they are better than beats? Can they also hook up with blue-tooth for wireless use? Which headphones are you referring to specifically? I had heard that the beats by Dre are a little over-hyped in the low end. I imagine you would really like the M50’s as they do have quite a bit of bass, although it’s cleaner, tighter, and more controlled. It thumps but it’s not overblown.. The Grado’s are good headphones but they are lacking a bit in the bass dept. and the build quality is a bit suspect. As far as bluetooth for the m50: Check this bluetooth mod from amazon.. apparently it’s really doable! Thanks, again your site has been very helpful! I just got my microphone back from storage and now I am looking into some headphones! I might just have to go with m50. I will do some more research and try to figure it out. Thanks for the review, I will be coming back often for more information. Thanks. Glad you are gaining a better understanding of what you need and don’t need for your studio. Come back by anytime! If you have any other questions, don’t hesitate to ask..
Music is such a large part of my life and I need to have a great pair of headphones to be able to switch the world off and dive into my choice of tracks to listen to without distraction. Both of these models look like they have appealing features, but the important thing for me is to be able to have the sound of every instrument come to me with such clarity that I feel I am almost there. Yes indeed! I agree. I love to hear those subtle nuances that aren’t heard in cheap models. The M50’s aren’t necessarily an audiophile headphone per se, but they truly made me a believer in better sound. There’s no going back to cheapie stuff!